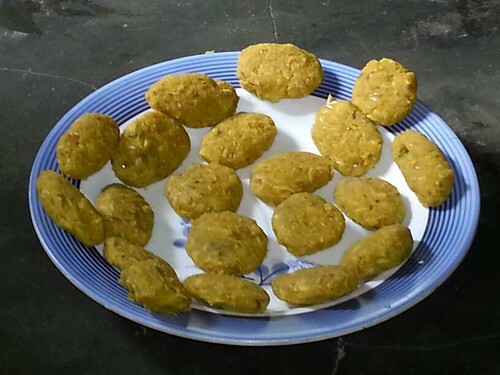 Mathi Cutlets refer to Kerala style fish cakes patties/croquettes. This particular fish cutlets are made from Mathi, the Malayalam term for Sardines. Fish Cutlets are made from varieties of fish, such as Mathi (Sardines) which are finely chopped and mixed with boiled mashed potatoes and spices, dipped in a Kadalamavu (Chickpea flour) or Rusks made into breadcrumbs then deep-fried in Coconut oil. Pictures below are uncooked/raw Mathi cutlets ready for frying in Coconut oil. The next pictures below are Fish/Mathi Cutlets after deep-frying in Coconut oil. Often served with rice, curry or chutney for lunch or dinner. But can also be served as savory snacks.